Like many, I am a lady with cravings. These cravings aren’t usually of the sweet kind, but mostly I long for something that has been deep fried and covered in salt. No matter how healthy I try to eat I can never kick my cravings for fried food, specifically for French fries. I’ve experimented with oven baked fries regularly however they rarely satisfy my cravings. When I came across this recipe in a Cook’s Illustrated Magazine I just knew I had to give it a try. If I could recreate the taste and texture of yummy French fries in an oven I knew I would be a happy lady. This recipe is a bit more high maintenance than my usual (slice up a potato, toss it in some oil and spices, and bake in a hot oven until it looks done-ish or I until I can’t wait any more), but the results are worth the effort. This recipe doesn’t require much in the way of ingredients. I have to be honest and admit I started off on the wrong foot with this recipe. The recipe calls for russet potatoes, however at my grocery store these don’t come loose and since I’m not trying to feed a family of 10, so I settled on your standard baking potato rather than a large bag of russets. When you slice up your potatoes into wedges, first of all be careful with your knife. When I was slicing my potatoes up I slipped and cut one of my fingers with my knife, which is apparently getting a little dull. But also, you want to make sure you are slicing up the potatoes into wedges that are even in size so that they cook evenly. One more note about when you slice the potatoes; if you feel you need to express yourself by peeling the potatoes don’t feel like you’re wrong. Do what you think is right. However, this recipe notes that it tested much better when the skins were left on and also I’m told the nutrients are all in the skin anyway. Yay nutrients! After you have your potatoes sliced preheat your oven to 457 and adjust the oven rack to the lowest position in your oven. Positioning your tray in the bottom of the oven will guarantee that your fries are browned evenly and quickly and will prevent overcooking to occur on the inside of your fry. Also note that with an oven this hot standard baking pans don’t always hold up, you’ll need to use a heavy duty pan. Next it’s time to soak the potatoes in hot tap water for 10 minutes. In order to get the desired texture of a delicious French fry this recipe employees a soaking and steaming method. Soaking the potato is a technique that is frequently used in making French fries that are actually fried. 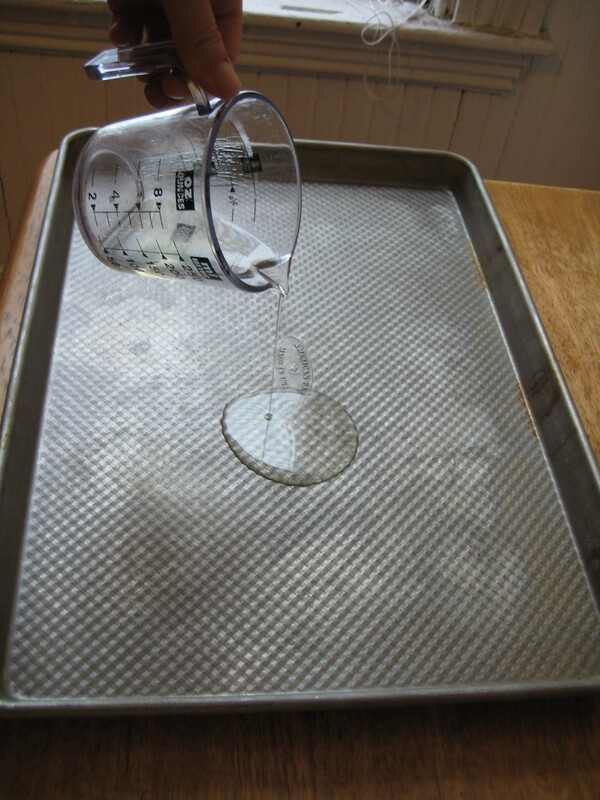 While the potatoes are soaking coat your pan with ¼ cup of oil. After the pan is evenly coated sprinkle your spices on the pan. The recipe calls for table salt and pepper. I used Jane’s Crazy Salt, because I love the stuff and I also like my fries to have a bit of a bite to them so I experimented with a pinch of cayenne pepper. Coating the pan with oil and spices assures that the potatoes are evenly covered with oil and the spices prevent the fries from sticking to the pan. 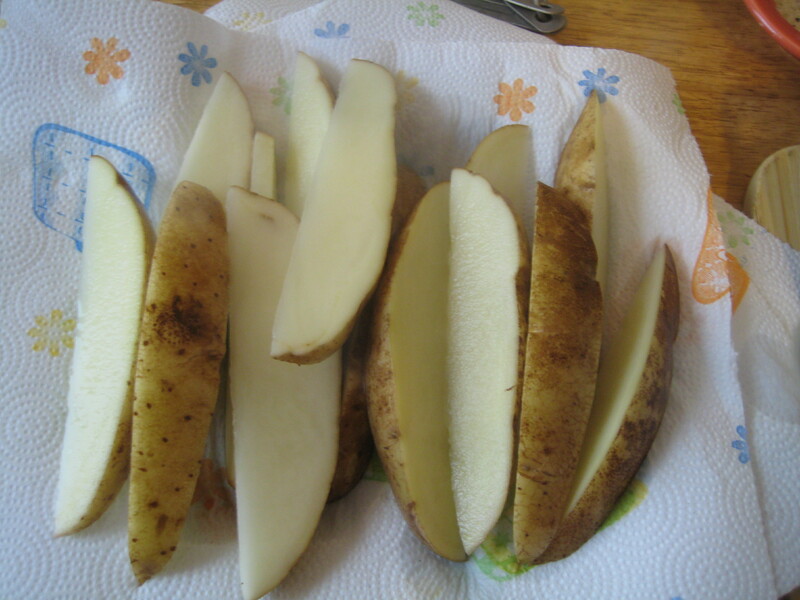 Now back to the potatoes, once they are done soaking put the wedges on a plate with paper towels and pat them dry. Then place them in a bowl and coat them with 1 teaspoon of oil. Next assemble your army of potato wedges in a single layer on your baking sheet. Cover the pan tightly with foil and put them in the oven for 5 minutes (this is the steaming part). 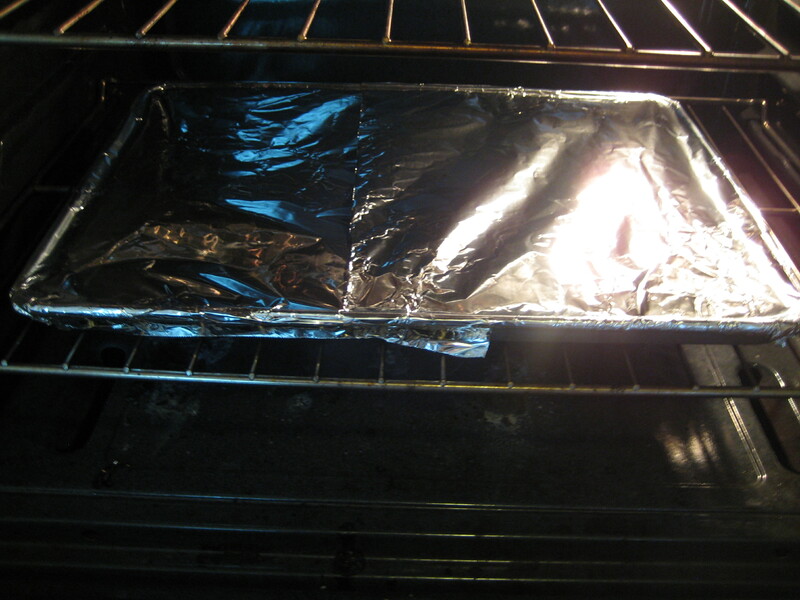 After 5 minutes remove the foil, bake for 10 minutes and rotate the pan. 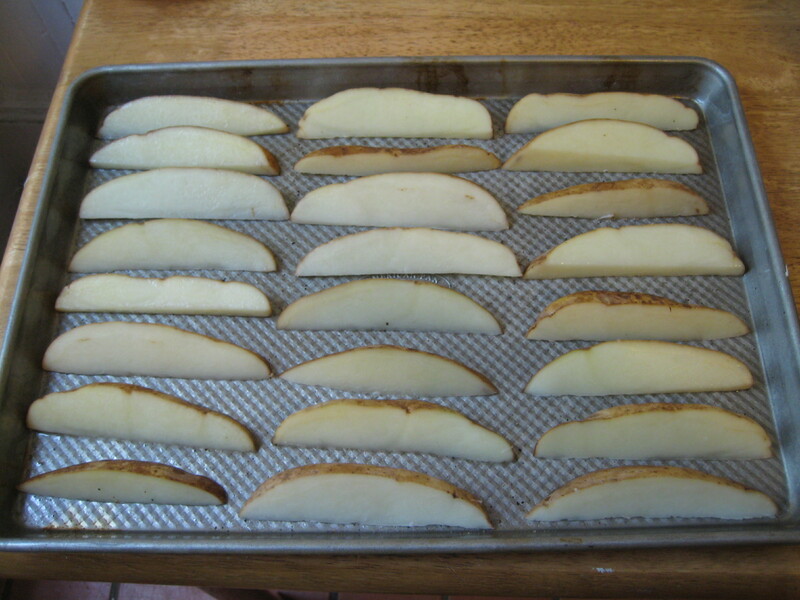 Bake for an additional 5-10 minutes until the bottoms of the wedges are spotted with patches of golden brown. Using a metal spatula flip over the wedges and put them back in the oven to cook for another 7-10 minutes. Once they are done cooking remove them from the pan and put them on paper towels to blot excessive oil. Season to taste and serve ‘em while they’re still hot. Adjust the racks in the oven to the lowest positions and preheat to 475 degrees. 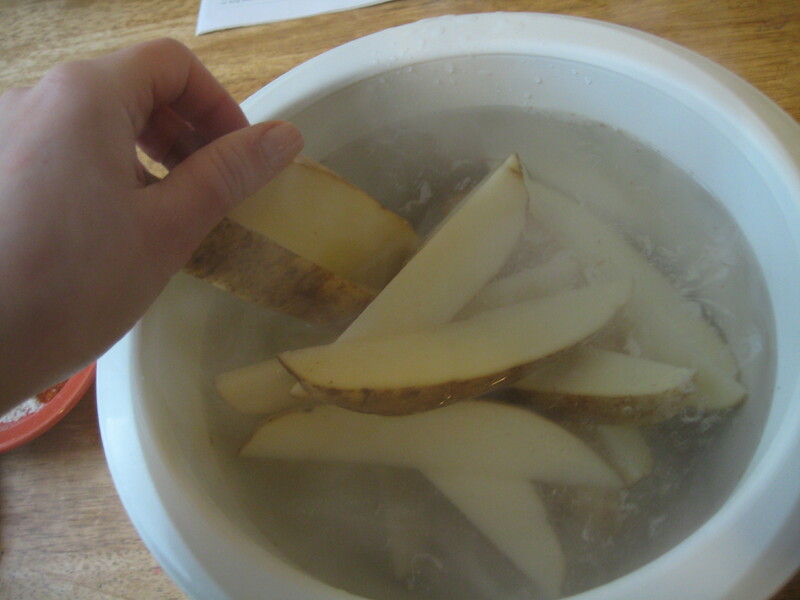 Fill a mixing bowl with hot water and soak the potato wedges for 10 minutes. While the potatoes are soaking coat your pan with ¼ cup of oil and sprinkle the salt, pepper, and paprika on the oiled pan. 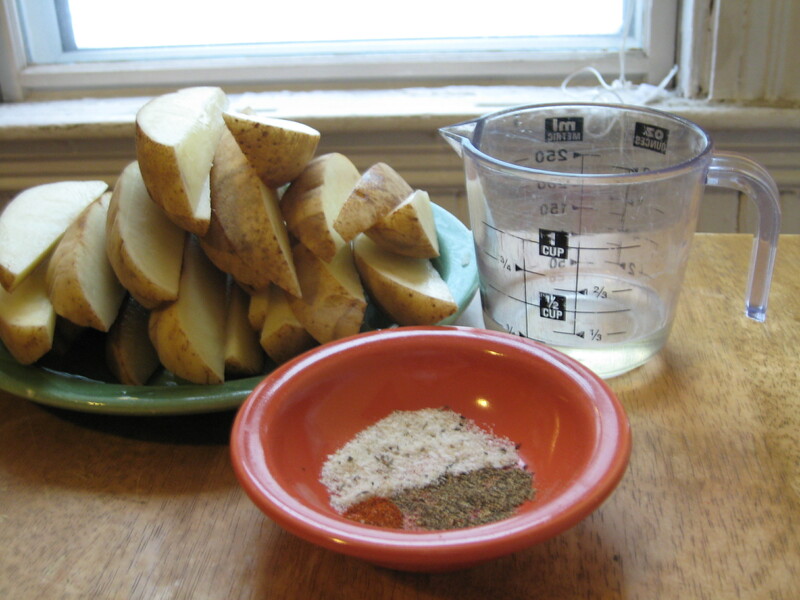 Now back to the potatoes, once they are done soaking put the wedges on a plate with paper towels and pat them dry. Then, place them in a bowl and coat them with 1 teaspoon of oil. 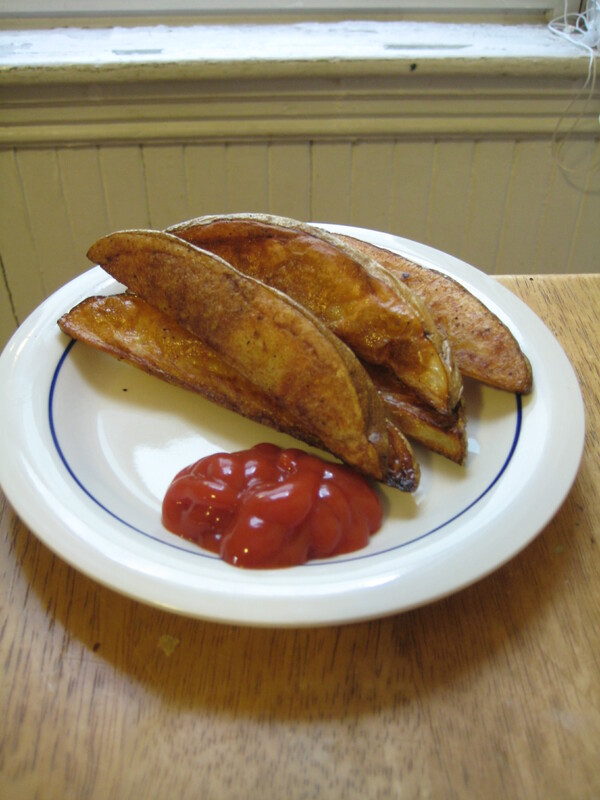 Place the potato wedges in a single layer on your baking sheet. Cover the pan tightly with foil and bake in the oven for 5 minutes. After 5 minutes remove the foil, bake for 10 minutes and rotate the pan. Bake for an additional 5-10 minutes until the bottoms of the wedges are spotted with patches of golden brown. Using a metal spatula flip over the wedges and put them back in the oven to cook for another 7-10 minutes. Once they are done cooking remove them from the pan and put them on paper towels to blot excess oil. Season to taste and serve warm.